From the outside, the bag looks like any other soft-sided insulated bag—one you might throw a few cold drinks in and keep on the boat or carry on a picnic. But as with most things, it’s what’s inside that counts. Crack open this bag and you’ll find it absolutely stuffed with bandages, gauze, tape, ice packs, trauma shears and other life-saving ephemera. Dangling on one end of the strap, a tiny red pouch from Burke’s Pharmacy contains a CPR mask. It may look like any other soft-sided insulated bag, but what you’ll find inside could mean all the difference for area student-athletes following an injury. 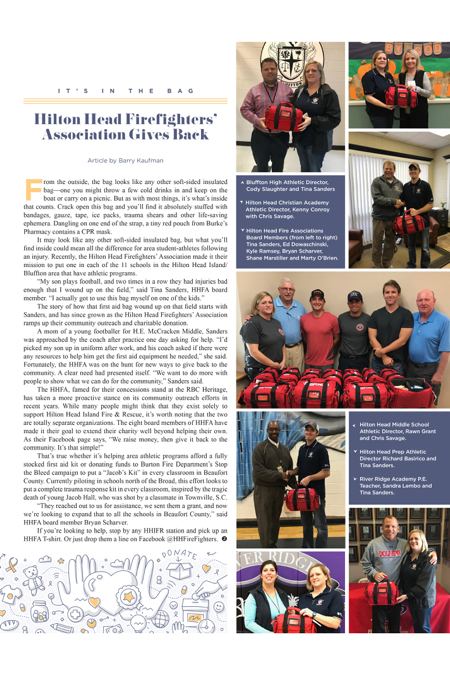 Recently, the Hilton Head Firefighters’ Association made it their mission to put one in each of the 11 schools in the Hilton Head Island/Bluffton area that have athletic programs. The story of how that first aid bag wound up on that field starts with Sanders, and has since grown as the Hilton Head Firefighters’ Association ramps up their community outreach and charitable donation. A mom of a young footballer for H.E. McCracken Middle, Sanders was approached by the coach after practice one day asking for help. “I’d picked my son up in uniform after work, and his coach asked if there were any resources to help him get the first aid equipment he needed,” she said. Fortunately, the HHFA was on the hunt for new ways to give back to the community. A clear need had presented itself. “We want to do more with people to show what we can do for the community,” Sanders said. That’s true whether it’s helping area athletic programs afford a fully stocked first aid kit or donating funds to Burton Fire Department’s Stop the Bleed campaign to put a “Jacob’s Kit” in every classroom in Beaufort County. Currently piloting in schools north of the Broad, this effort looks to put a complete trauma response kit in every classroom, inspired by the tragic death of young Jacob Hall, who was shot by a classmate in Townville, S.C.
“They reached out to us for assistance, we sent them a grant, and now we’re looking to expand that to all the schools in Beaufort County,” said HHFA board member Bryan Scharver. If you’re looking to help, stop by any HHIFR station and pick up an HHFA T-shirt. Or just drop them a line on Facebook @HHFireFighters. JUNE 2011: Chairty Corner - Giving To Charities: Who Can You Trust?